It's cliché, but the Pats know the game will be won in the trenches. MINNEAPOLIS – They all seemed robotic, and as if scripted, programmed to do and say the same things. Rinse, repeat, and say it again. The New England Patriots' offensive line was an engaging, genial group on the final Super Bowl LII media day on Thursday - all espousing the greatness of the Eagles' defensive front. They were mammoth salesmen, nearly convincing enough to make you believe that the Patriots were about to face the Steelers' Steel Curtain of the 1970s on Sunday in Super Bowl LII and not Fletcher Cox, Tim Jernigan, Brandon Graham and Vinny Curry. The Eagles winning their first Super Bowl will come down to how much pressure Cox, Jernigan, Graham, Curry, and their buddies, Chris Long, Beau Allen, Derek Barnett and Destiny Vaeao, can put on the sacred cow, Tom Brady. If New England is going to join Pittsburgh as the NFL's only other six-time Super Bowl champion, they'll need Nate Solder, Joe Thuney, David Andrews, Shaq Mason and Cameron Fleming to keep No. 12 upright and clean. The Patriots gave up just three sacks for minus-12 yards in the AFC playoffs. The Tennessee Titans and Jacksonville Jaguars were among the two best pass-rushing teams in the NFL. The Titans (43 sacks, ranked No. 5 in the regular season) never got close to Brady, while the Jaguars (55, ranked No. 2) managed to pull him down three times. The Eagles, however, aren't so much a sack-oriented defensive line as they are a pressure front. Their 38 sacks ranked them 15th overall in the NFL and they had four sacks during the playoffs. Rotating eight players has generated a pressure rate of 41.5 percent, according to Pro Football Focus, which is considered far above average. Couple that with one of the lowest blitz rates in the NFL (23.4%) and it spells possible trouble for the Pats. Additional problems for New England is the Eagles blitz packages they did run during the playoffs. They caught both Atlanta's Matt Ryan and Minnesota's Case Keenum off guard. The Eagles pressured Ryan 16 of the 39 (41%) times he dropped back. In the NFC championship, Keenum was pressured 24 of 50 drop backs (48%). So even if Brady is untouched, it doesn't mean he can't be unhinged by the pressure. 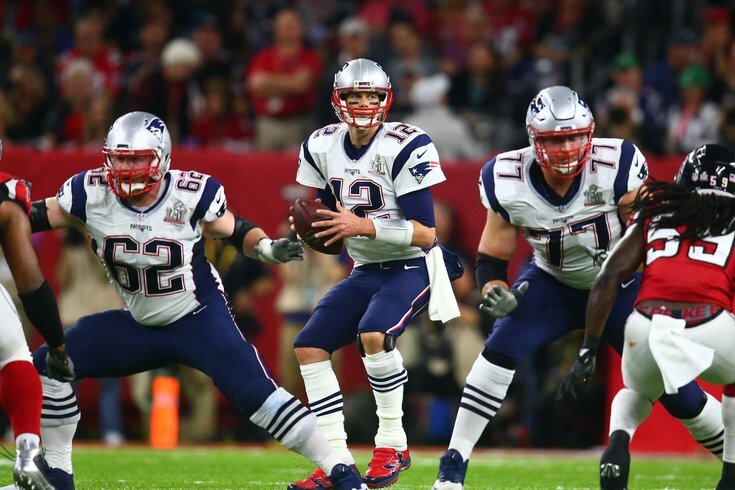 "I'll tell you this, they're lining up in low three-point stances and firing off the ball, and they're physical," said Solder, the Pats' left tackle. "They're very competitive and they never finish on any plays. They're constantly chasing after the ball. They make it really hard on you. "The keys for us is we're going to have to play our best ball. These guys are the best team we've played this season. There is a reason why they're here. They're the best group of defensive linemen we've played all season and the best defense that we've played all season. It's going to be a great team effort to accomplish our goals. "The energy that they bring is rare and unique. They'll blitz, they won't blitz, they'll rush, they'll twist, they'll stunt. They do all of these things but they might not do all of those things to keep you off balance. Their defensive coordinator [Jim] Schwartz does a great job. They come at you from different directions." "I think the Eagles are the best team we've faced this year. They're in the Super Bowl for a reason." Mason, the Pats' right guard, says that New England didn't have anything tangible to compare the Eagles against this season. Not even Jacksonville's formidable front. "The Eagles are the best team we'll face this year, and their front is definitely the best we'll see this year," Mason said. "Anytime No. 12 is upright, that's a good thing for us and our priority." The problem, Thuney noted, is how long the Patriots will be able to stay with the Eagles' defensive front. "We don't have that luxury of rotating in and out," said the Pats' left guard. "They are relentless. They keep coming. We'll have to rely on our conditioning that we built up through the year. It's going to be a 60-minute game. It's going to be a fight, and I'm just looking forward to it. One big reason being the defensive front.